Since this site was started in 2012, many individuals have submitted questions about nattokinase and serrapeptase. You can read many of them in the comments section of the various pages, but some of these pages are quite lengthy by now. 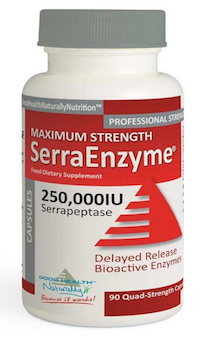 So we have completed this page for you, which contains a quick reference to frequently asked questions about these two amazing proteolytic (and fibrinolytic) enzymes. 1. Can you take serrapeptase if you’re taking Warfarin (Coumadin)? Yes. Serrapeptase is not a blood thinner. 2. Can you take serrapeptase for varicose veins? Yes. Serrapeptase has been known to clear varicose veins after a few short months. However, it cannot repair damaged valves. 3. Can you take serrapeptase if you’re taking aspirin? Yes. There is no interaction between them. 4. Can serrapeptase be used to treat non-malignant tumors? Yes. Serrapeptase is already being used for this purpose. 5. Can serrapeptase help with blocked Fallopian tubes? Yes. Serrapeptase is being used to support women’s health. 6. Can serrapeptase be used to treat goiter? As part of a more comprehensive health plan, yes it can. 7. Can serrapeptase help women to conceive? Yes. Serrapeptase is a safe and effective treatment for women suffering with fibroid’s, blocked fallopian tubes or ovarian cysts. 8. Can serrapeptase be used to treat eye-floaters? Yes. But with a wider, more comprehensive treatment plan. 9. Can serrapeptase be used to treat dogs, and other pets/animals? Yes. Treating your pets with serrapeptase is perfectly safe. There is a product specifically for pets, called SerraPet. Even in animals, excess inflammation causes problems, discomfort and pain, which can be relieved with proteolytic enzymes. 10. Is serrapeptase safe for children? Yes. Children under 10 years of age can take up to 2 capsules per day. 11. Is serrapeptase safe for pregnant women and during breast feeding? Yes. Serrapeptase can also be taken to treat mastitis. 12. Can serrapeptase help dissolve internal scar tissue? Yes. Serrapeptase will break up and remove scar tissue. 13. Does the age of the scar tissue matter, for serrapeptase to break it up? No. The age of scar tissue is irrelevant for it to work. 14. Can you take serrapeptase with any prescription drug? Yes. There are no proven interactions with prescription medicines. 15. Can serrapeptase help treat Irritable Bowel Syndrome (IBS)? Serrapeptase can help to improve digestive health. 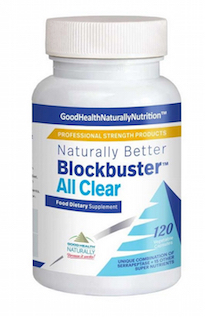 It dissolves and removes dead tissue associated with inflammation in the gut. 16. Can serrapeptase help with Crohn’s disease? Yes. As with IBS, inflammation of the gut is to blame, and serrapeptase can help. 17. How long has serrapeptase been used to naturally treat medical conditions? 17. Can serrapeptase help with post-op (surgery) recovery? Yes. Serrapeptase will help to reduce soreness and swelling after surgery. 18. How soon after surgery can you take serrapeptase? You can start taking it 48 hours post surgery. 19. Can serrapeptase help to relieve symptoms of gallstones? Yes, the enzyme (as part of a natural health plan) will break up and dissolve inflammation associated with gallstones. 20. Can you take serrapeptase if you are a diabetic? Yes. And there are positive reports of serrapeptase balancing blood sugars in diabetics, with part of a wider natural health plan. 21. Do serrapeptase capsules need to be enteric coated to be effective in the body? Yes. Serrapeptase would be eaten by stomach acid otherwise, and needs to be absorbed through the walls in the small intestine. 22. Can serrapeptase help with erectile dysfunction? There are positive reports that serrapeptase can help improve men’s health this way. 23. Can serrapeptase help with breast engorgement (Nodular Mastitis)? Yes. 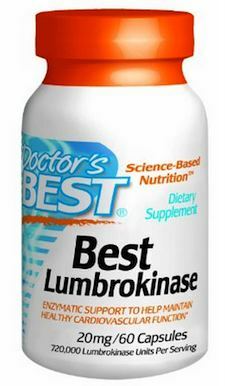 It can help relieve symptoms, when combined with a healthy lifestyle and nutrition plan. 24. Can serrapeptase help with capsular contraction pain, after breast augmentation? Yes. It can help relieve symptoms, and testimonials suggest using serrapeptase after the procedure (if symptoms occur), that it could prevent further pain-relief surgery. 25. Can serrapeptase help with Post Partum period pain and discomfort? Yes, it will eat through and remove dead/scar tissue, allowing the body to regenerate healthy tissue. 26. Can serrapeptase help relieve symptoms of chronic ear infections? Yes. Serrapeptase can help break up and remove inflammation associated with chronic ear infection, along with a wider health plan, including increased water intake, a healthy lifestyle and (possibly) excluding wheat and dairy from diet. 1. Is nattokinase safe for people with soy allergies? Yes. The nattokinase supplement only contains the enzyme extract, and nothing else from the fermented soy beans (Natto), so the nattokinase supplement is safe for people who have an allergy to soy products. 2. 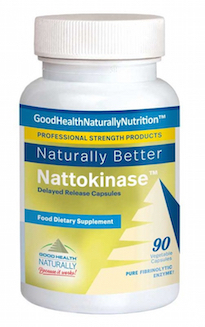 Is nattokinase the same as Vitamin K2? No. Nattokinase does not contain K2, but does contain vitamin K1. Vitamin K2 is only found in the originating food source, called Natto, not the enzyme that you get in supplement form. 3. Can you take nattokinase if you’re taking warfarin (Coumadin)? Yes. There is no interaction between them, they do different jobs – nattokinase dissolves blood clots, but warfarin stops them forming. 4. Can you take nattokinase if you have low blood pressure? The best advice is no, because nattokinase reduces high blood pressure (Hypertension). 5. Can you take nattokinase if you are taking omega-3 essential fatty acid supplements? If you want to take nattokinase, consider reducing your dose of omega-3’s. Omega-3 is also an anti-coagulant, so taking two types might be detrimental to blood coagulation. 6. Are there any side effects to nattokinase? Read our article on the side effects of nattokinase. 7. Can you take nattokinase to lower cholesterol? Yes. Nattokinase lowers bad cholesterol. 8. Can you take nattokinase if you’re taking aspirin? The best is advice is no. Although there are conflicting answers among ‘experts’, some say the risk of bleeding is higher when taking both together, and others suggest it’s ok, because they do different jobs. 9. Can you take nattokinase if you’ve had a blood clot (deep vein thrombosis) in your legs? Yes. Nattokinase will help with blood circulation, and is the reason I started taking it, leading to the construction of this website. 10. Can you take nattokinase with Ibuprofen? No. Ibuprofen is a NSAID which acts as a blood thinner. 11. How long, after surgery, can you take nattokinase? Experts recommend anywhere from one week, to a month after surgery. 12. Can you take nattokinase if you are pregnant (or breast feeding)? The best advice is no, because nattokinase is a natural blood thinner and it may be passed to the fetus. More research is needed into this topic. 13. Can you take nattokinase for Atrial fibrillation? Yes. But you should also consider an extended health plan, which includes magnesium oil, serrapeptase, and digestive enzymes. 14. How is nattokinase measured? Nattokinase is measured in fibrinolytic units (FU’s). Beware of some brands measuring in milligrams, because this only shows the weight, not the potency of the enzyme itself (FU). 15. Is nattokinase suitable for vegetarians and vegans? Yes. Nattokinase does not contain animal products or derivatives.